The first makeover of the Arlington National Cemetery welcome center in 20 years included six large murals of scenes around the cemetery. 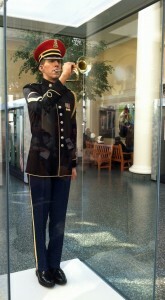 However, the centerpiece of the room is a Taps bugler patterned after Staff Sgt. Jesse Tubb of South Lake Tahoe, Calif. who’s part of the U.S. Army Band. The lifesized model shows Tubbs playing the song performed throughout Arlington during funerals. Nearby are murals depicting the 1963 funeral procession of U.S. President John F. Kennedy, space shuttle Challenger Memorial, history of Arlington House, Freedman’s Village, the cemetery’s history and funeral processions. This entry was posted in Arlington National Cemetery and tagged Arlington National Cemetery, Best Arlington National Cemetery walking tours, bugler, Photo by Rick Snider, welcome center. Bookmark the permalink.